Harvard’s endowment was valued at $36.4 billion last June 30, the end of fiscal year 2014—$3.7 billion more (11.3 percent) than at the end of fiscal 2013 , and within a half-billion dollars of the peak value achieved in fiscal 2008, just before the financial crisis. The report, issued in late September, was the last wholly under the leadership of Jane L. Mendillo, president and chief executive officer of Harvard Management Company (HMC), who is stepping down at the end of 2014 (see “Endowment Exit,”  September-October, page 18). The fiscal 2014 appreciation in Harvard’s endowment reflects the investment return (perhaps $5 billion), minus distributions to support University operations and for other purposes (perhaps $1.6 billion), plus gifts received (expected to be healthy, given the capital campaign—see “Capitalizing,”  page 26; exact figures will appear in the annual financial report later this fall). In a year of strong stock-market returns, HMC’s public equities (about one-third of assets) gained 20.4 percent, slightly beneath their benchmark. Private-equity and venture-capital investments (about one-sixth of the portfolio) yielded 20.3 percent: again, slightly below the benchmark. Venture-capital returns were robust, but Mendillo pointed to underperformance in “legacy” private-equity investments made in the prior decade. Absolute-return assets (hedge funds, about one-sixth of assets) gained 12.2 percent, well above their benchmark. The fixed-income portfolios (10 percent of assets) generated 7.7 percent returns, above market gains. Real assets (real estate, timber and farmland, and commodities, 25 percent of the investments) earned a 10.9 percent return. Blyth, who has taught statistics and worked with campus cricket players while managing investments, acknowledged the complexity of the diverse portfoliothat supports Harvard’s long-term needs, and the focus on liquidity since 2008. He said he had “a lot to learn” from fellow HMC investment professionals, and could “rely on excellent colleagues” in doing so. Noting that his new responsibilities did mean that he would have to absent himself, for a while, from interacting with “spectacular” Harvard undergraduates, Blyth said that his teaching “reinforces for me what the endowment is really all about”: supporting the University’s academic enterprise. 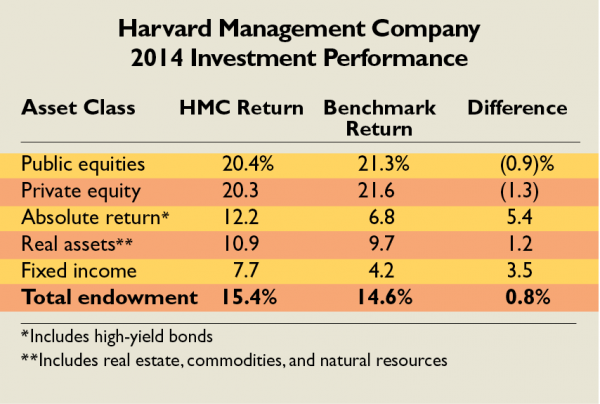 For a detailed report on HMC’s performance by asset class, see harvardmag.com/endowment-15 . 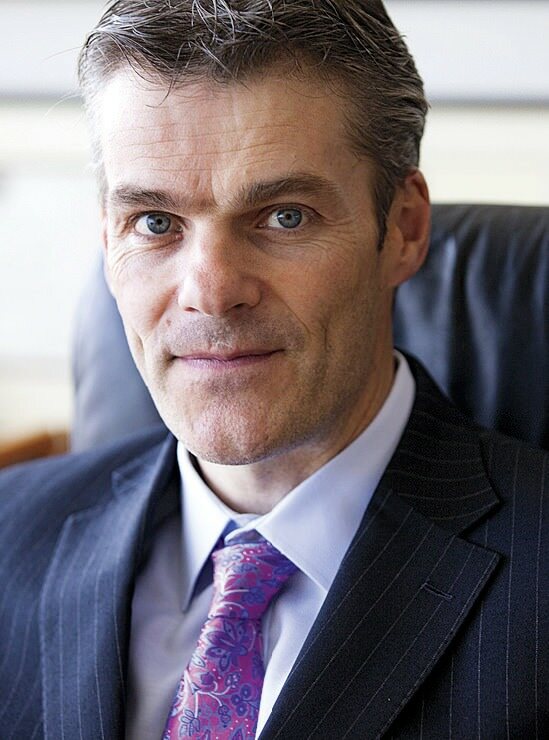 For more information about Stephen Blyth, see harvardmag.com/ceo-14 .